President Muhammadu Buhari has intervened in the on-going crisis in the National Health Insurance Scheme (NHIS) over the suspension of the Executive Secretary Prof. Usman Yusuf by the Governing Council of the Scheme. The ES who had refused to go on the suspension and had forced his way into the office building a day after he was suspended, has been directed by President Buhari to proceed on administrative leave. The ES who had been enmeshed in series of controversy included an earlier suspension by the Minister of Health Isaac Adewole, had been quoted many times saying that only President Muhammadu Buhari could suspend him or sack him. The headquarters of the Scheme had been marred by protests by the labour unions of the scheme who insisted that the Executive Secretary must proceed on the suspension. Earlier on Tuesday, the two labour unions renewed their resolve to sustain their ongoing protest over the suspension of Prof. Usman Yusuf, the Executive Secretary of National Health Insurance Scheme (NHIS), by the Governing Council of the organisation. The trade unions are the Association of Senior Civil Servants of Nigeria (ASCSN), and Medical and Health Workers Union of Nigeria (MHWUN). Mr Abdulrazak Omomaji, the Chairman of ASCSN, made this known to the News Agency of Nigeria (NAN) in Abuja, while reacting to the statement by the Secretary to the Government of the Federation (SGF), Mr Boss Mustapha. NAN recalls that Mustapha on Oct. 29 at a retreat for boards and governing councils as well as chief executives of MDAs clarified that as appointees of the President, the boards and councils have no power to suspend any chief executive without recourse to due process. However, Omomaji said that the union was still awaiting government reaction to their demands over the allegations of maladministration by Yusuf. He explained that the Act establishing the NHIS was unique that gives the governing council the powers to suspend the executive secretary. "I want to clarify that the Act which establishes the NHIS is different from the other government parastatals which are guided by boards and directors. "The governing council of the NHIS however acted within its jurisdiction, they are the chief security officer of the organisation and have the powers to discipline and suspend. "Let it be clear that Council has not removed Prof. Usman Yusuf, but have asked him to step aside for investigations after which findings will be forwarded to the Minister of Health. "Council is therefore in order, and we shall continue with the protest as we await government's reaction," the chairman said. NAN recalls that the SGF had explained that 'no governing board of a federal agency or parastatal has the power to remove the chief executive appointed by the President. "The board may however articulate infractions, investigate wrong doing and make recommendations to government through the supervisory minister," Mustapha said. He made the clarification at an induction programme for governing board members of federal parastatals, universities and medical centres at the Transcorp Hilton Hotel, Abuja. 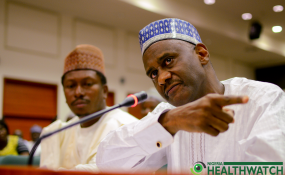 The declaration came amidst controversy over the suspension of Yusuf by the NHIS governing council. On Oct. 18, the Chairman of the NHIS board, Mrs Ifenne Enyanatu, announced the indefinite suspension of the executive secretary, eight months after a similar suspension by the Minister of Health, Prof. Isaac Adewole, was annulled by the Presidency because due process was flawed. Enyanatu said the governing council resolved to suspend Yusuf because it had received several petitions against the NHIS boss. She said the board had the permission of the minister of health to suspend Yusuf, pending investigation. However, Yusuf ignored the order and resumed normal duty. The direction by President Muhammadu Buhari may have put to rest the issues.